Climatologists say Texas will see more heavy rain events like Hurricane Harvey, which devastated Houston last year. The National Oceanic and Atmospheric Administration came out with an analysis this fall that found Austin and other parts of the state should expect more flooding in the future. And, as it turns out, Texas may see even more flooding than the Atlas 14 study suggests. If you have a mind for numbers, Atlas 14 is pretty straightforward: It gives odds of storms happening in different places in different time frames. For example, the report may tell you your city’s annual odds of receiving, say, 13 inches of rain fall in the course of 12 hours. Those numbers are important. Cities and towns use them to assign flood risk, and that dictates everything from infrastructure spending to public safety policy to building regulations. So how does Atlas 14 determine risk? By looking at past rainfall. The last federal study like Atlas 14 was released in 1961. That means the report released in September includes nearly 60 years of new rainfall data. There have been more extreme storms over that time, which is one reason the study shows greater storm and flood risk. That's also where climate change comes in. “The change in climate is getting baked into these new numbers,” says Victor Murphy, a climate service program manager with the National Weather Service in Fort Worth. Here’s how: Scientists know that the Earth's warming atmosphere is causing more extreme storms. But, those more recent climate-influenced storms had not been part of the historical data. Now that those storms are included, the greater risk has become apparent. Hurricane Harvey is a good example, Murphy says. 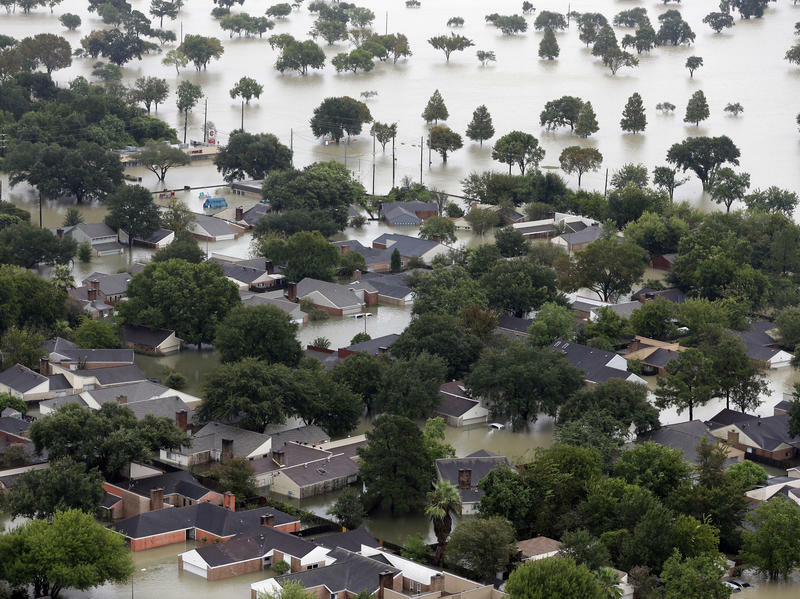 As troubling as the findings of Atlas 14 may be for communities preparing for flooding, the study may still underrepresent the risk of climate-driven storms in some parts of Texas. One reason is that it still includes rainfall data from a time when climate change was not having as pronounced an impact on the weather. On Sunday morning Jessica Hulsey woke up in her home in Houston’s East End. She went to her front door to see how high the water had risen – but it wasn’t the water that surprised her. The National Weather Center is calling Tropical Storm Harvey "unprecedented" and says all impacts are unknown. The agency now reports rainfall from the storm could reach 50 inches — the highest ever recorded in Texas. The Federal Emergency Management Agency says this "disaster is going to be a landmark event."